The 2010 Mnet Asian Music Awards was held last weekend in Macau's Cotai Arena, Venetian Hotel. JYP Entertainment's girlgroup, Miss A was there to perform and receive 'Song Of The Year', 'Best New Female Artist' and Best Dance Performance (Female)' awards. Unlike 2NE1, Miss A are less-fashionable. They debuted with American Apparel outfits for their 'Bad Girl, Good Girl (Bad but Good)' concept. They are usually dressed in simple clothes.. nothing bizarre or quirky. When they returned with 'Breathe (Step Up)', they had a 360° wardrobe change. From black and boring outfits to fun and colorful outfits. Though it was more pleasing to the eye, I felt that their stylist could have done a better job. 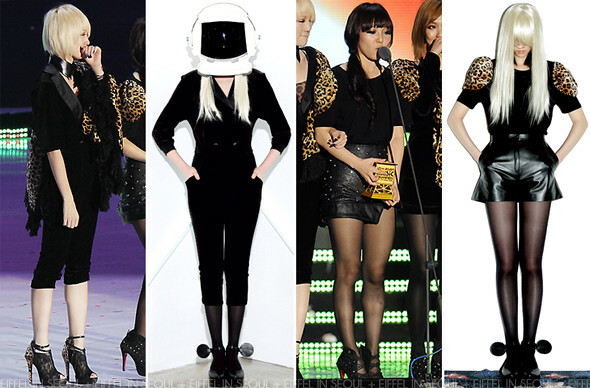 At 2010 Mnet Asian Music Awards, the girls had a few outfit changes. One of the sets were from Fleamadonna. We've seen JYP's Wonder Girls in Fleamadonna's designs. So it didn't come as a surprise that Miss A would pick up the brand too. The outfits are from Fleamadonna's Fall/Winter 2010 collection which f(x) were sporting in their album, Nu Abo. Fei and Suzy were both in Fleamadonna dresses. What caught my attention was definitely Suzy's Mouse Ear Platform Wedges, also from Fleamadonna. They reminded me of Jeremy Scott's Mickey Mouse Sunglasses. Unfortunately, it seems like she didn't know how to wear those wedges properly.. pity. Jia also had a leopard print scarf on her, styled with her outfit as well as Christian Louboutin Lace Booties replicas. While Min was dressed in Fleamadonna's T-Shirt with exaggerated leopard print shoulders. Leopard prints aren't easy to pull off, most of the time you may look tacky in them. I am also not a fan of leopard prints myself. What do you think of their outfits?